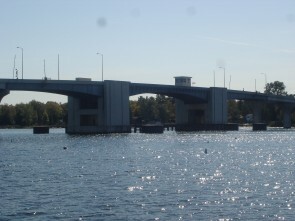 The Department of Transportation has decided to put off work on the Bayview Bridge in Sturgeon Bay for a year. the Green Bay office has announced that the upgrade for the more than 30 year old span would be done in the Spring of next year, but now says the work will not happen until early Spring of 2013. Will Dorsey, the DOT’s regional director in Green Bay, says the state agency can lessen the total traffic impact in Door County by combining the bridge work & a road project in 2013. The Bayview Bridge is scheduled for a new deck, approaches & electrical upgrades, including the ability for remote operations. It will be completely closed to traffic during the repairs. The new plan calls for the bridge work to be combined with another project on Highway 42/57 that runs about ten miles from County MM to East Jorns Road, North of the bridge. The highway rehabilitation project includes both traffic safety & operational improvements. Work on the highway will be done under traffic with single lane closures. The DOT hopes to begin both projects in early Spring of 2013 & have the road & bridge open to traffic by the 4th of July holiday.